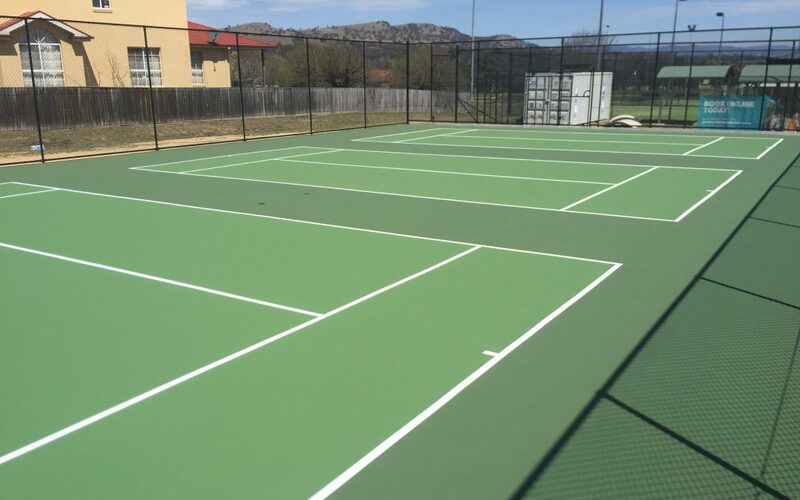 Young kids learning tennis at Jerrabomberra Tennis Club in New South Wales are now able to get active on a set of brand new hot shots tennis courts. The Dynamic Sports Facilities team recently completed a project that added 3 new hot shots courts to the existing club facilities. President of Jerrabomberra Tennis Club, John Talbot, says the smaller hot shot sized courts are perfect for kids learning to play tennis and also make great use of smaller spaces. “Hot shots courts area a great stepping stone to playing on full size courts and allow the kids to go onto social or tournament tennis. These new courts allow us to teach kids the basic skills without the frustration kids might feel in trying to learn on a full size court,” John said. Hot shots courts are designed for kids aged 5 – 9 years to allow them to develop their tennis skills. The smaller size of the court, lower net and lighter racquets make picking up tennis skills that much easier for young kids who would normally struggle to hit the ball the length of a full size court. “Prior to having these hot shots courts installed we would need to set up portable nets and put markers out to indicate the court when we were coaching our young players. Now with the new courts it’s great! We don’t have to set anything up and we still have our full size courts available should people want to hire them out,” John said. The Dynamic Sports Facilities team began the job by excavating the space for the courts and constructing a retaining wall around the perimeter. Preparation and construction of the concrete slab was next and finally the courts were surfaced in Rebound Ace Sports ‘Synpave’ acrylic coating in grass green on the playing surface and moss green on the surrounds to match the existing full size courts. The team also supplied and installed three premium hot shots tennis nets and posts. Three metre high black fencing and gates were installed and additional concrete footpaths and stairs finalised the project. The Dynamic Sports Facilities team are excited to be able to hand over another project which allows the community, especially young kids, to get active! Do you need a new sports facility built for your club? Our team can assess your existing facilities with an on-site inspection and recommend specific remedies or a whole new design. From residential, to community and commercial projects, Dynamic Sports Facilities can help you to produce a useful and attractive sports facility that will encourage everyone to get active.